Who were those graceful dancers found throughout the India levels in 'Tomb Raider 3'? Read on and find out! It recently came to my attention that, despite having launched this blog almost two years ago, I still hadn’t written any articles on the Core Design classic Tomb Raider 3. So it’s time to set that right. 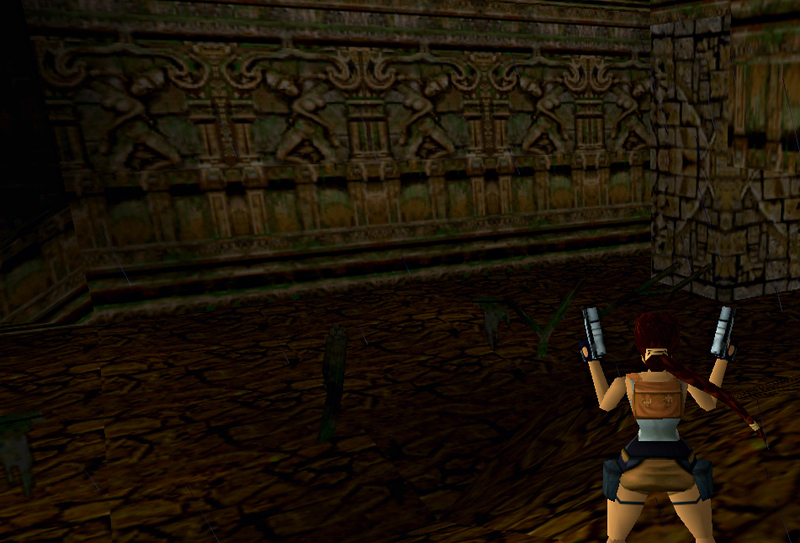 Introducing new vehicles and a less linear globe-trotting adventure, Tomb Raider 3 also featured some stunning artwork from the Indian subcontinent and Southeast Asia, such as the dancers motif seen in the screenshot below and throughout the game’s India levels. The dancers are, in fact, apsaras (often described as “divine nymphs” or “celestial dancers”) and are commonly found adorning the walls of Hindu and Buddhist temples across Asia. Apsaras are largely depicted as graceful, youthful maidens with slender waists, curvaceous hips and busts, and serene smiling faces. While they are sometimes associated with fertility rites, they are best known for being skilled dancers and were often paired with gandharvas, the male singers and musicians who entertained at the court of Indra, the Hindu king of the gods. Although they look naked at first glance, apsaras often wore collars of beads and pearls, jewellery, elaborate headdresses, and long, transparent skirts of fine cotton or silk. The celestial dancers seen in the screenshot above are striking a pose known as the tribhanga. The tribhanga, which means “thrice bent”, is characterized by an almost S-shaped posture, where the dancer bends her body at the neck, waist, and knees. Although it may look a little uncomfortable to the untrained eye, the tribhanga is considered a graceful, feminine, and sensual pose and is commonly seen in traditional Indian art and classical Odissi dance. 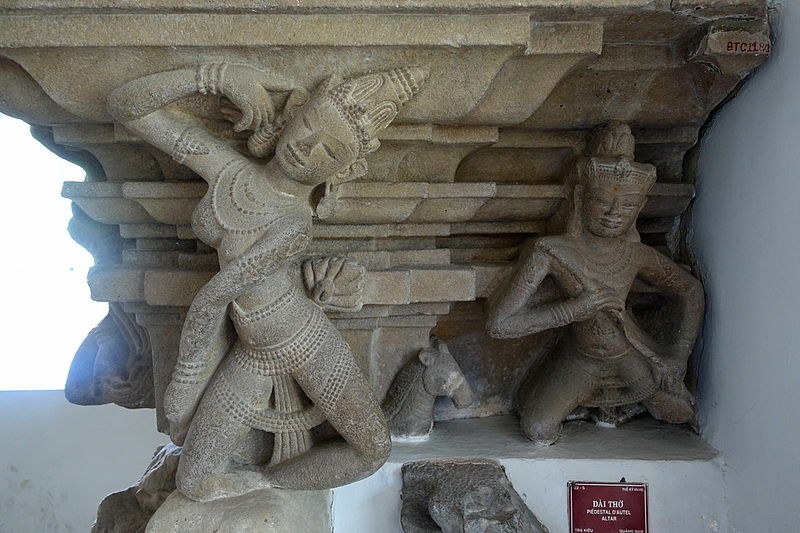 All this talk of Indian culture and Hinduism must have given you the impression that the dancer motif seen in TR3 is based on a sculpture or painting found in India, right? Well, actually…it’s not. The motif is probably based on a sculpture known as the “Dancers’ Pedestal” which was found further east, at an archaeological site in the village of Trà Kiệu in Vietnam’s Quảng Nam Province. Trà Kiệu is thought to be the site of Simhapura (or the “Lion Citadel”), one of the Champa kingdom’s first capital cities, and was part of what some refer to as “Greater India”. Champa was one of the many Hindu kingdoms that sprang up across Southeast Asia in the first millennium CE and, as a result of maritime trade and military conquest, its art and culture came to be heavily influenced by that of the Indian subcontinent. Sadly, very little remains of Simhapura and other Champa cities as their ancient buildings were destroyed by carpet bombing during the Vietnam War (and subsequently looted) but the temple ruins at Mỹ Sơn and Nha Trang bear testament to a sophisticated artistic tradition, one characterized by sandstone sculptures and stunning red-brick temple complexes. But let’s get back to the “Dancer’s Pedestal”, which can be found on display at the Museum of Cham Sculpture in Đà Nẵng. This sandstone cornerpiece, which depicts a dancing apsara and a male musician (gandharva), was carved sometime between the 7th and 10th centuries (the dates vary from source to source) and is one of the finest surviving examples of Trà Kiệu art. Its function is unclear, though some archaeologists believe it may have once decorated the outer walls of a temple sanctuary or tower. If you’d like to learn more about Vietnamese art, history, and archaeology, you can find some interesting sites and articles in the “Sources and Further Reading” section below!